Right after the Bukit Rambai Cendol, we adjourned to 486 Baba Low for lunch. 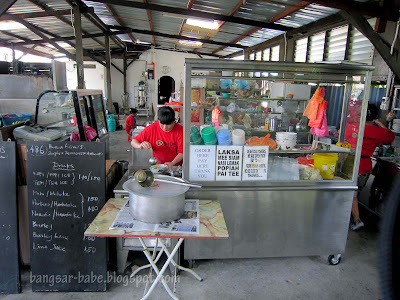 Like the cendol stall, this humble shack is located in the backyard of a colonial-style bungalow, and specialises in Malacca Peranakan Food. Place your order at the counter/kitchen area, and they will deliver the food to your table. My friends and I ordered a Nyonya laksa (RM4 per bowl) each, followed by a plate of pai tee (RM3.50) and popiah (RM2.70) to share. 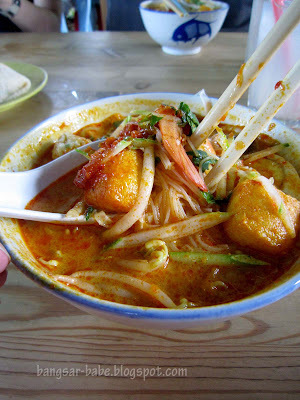 For the uninitiated, there is a difference between Nyonya Laksa and curry laksa. Nyonya laksa broth is prepared using chicken and prawns while curry laksa uses chicken stock. The red-orange dotted oil on top of the Nyonya laksa comes from the prawns, which gives the curry a richer and sweeter taste. 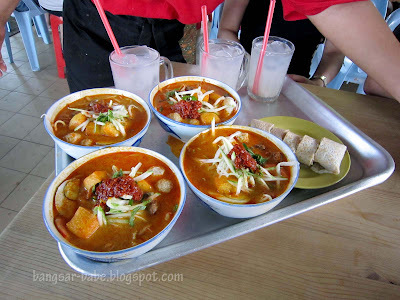 Baba Low’s laksa was pungent, ‘lemak’ and fully flavoured from the blend of spices and chillies. My bowl was filled with julienned cucumber, daun kesum (laksa leaf), noodles (yellow mee + beehoon), juicy cockles, tofu puffs, half a boiled egg and prawns. I ate everything, right down to the last drop of laksa broth. 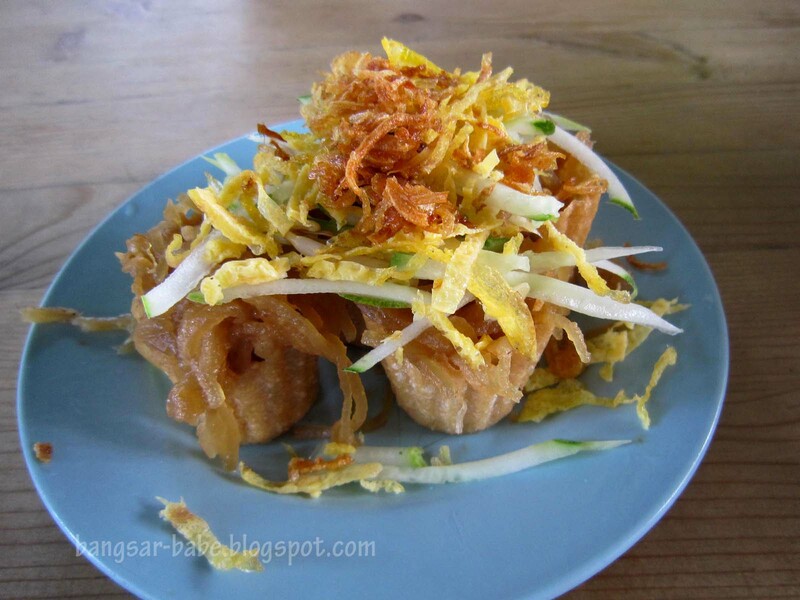 Pai Tee, also known as top hats, is a crunchy flour cup filled with julienned sengkuang, cucumber, omelette slices and fried shallots. These tiny treats went very well with the chilli sauce provided. Simply pop it into your mouth and enjoy its crunchiness. The ‘hats’ were quite small – I could have polished all 5 pieces easily. Baba Low’s popiah boasted plenty of bean sprouts, cooked sengkuang, julienned cucumber and egg strips. I liked the special sweet sauce used to flavour the popiah. According to rif’s father, the sweet sauce was made with Gula Melaka. 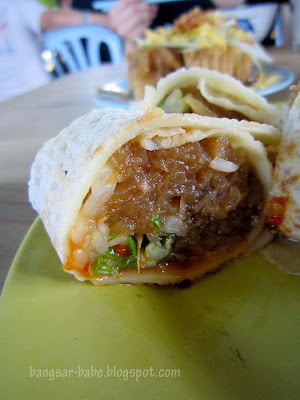 The egg-skin wrap was of just the right thickness and held the popiah together nicely. Moist, generously filled and full of oomph from the chilli sauce – what’s not to like? Verdict: I came, I tried, I’M HOOKED! Wow! Sounds like a must try! Will definitely give it a try the next time I visit Malacca. You been to a right place for a good meal. i’m mainly working on non profit project to promote Melaka as a tourism spot. Feel free to share your food related info there. Nice page for Melaka travel “LIKE” it to support. I just visited this Baba Low yesterday(10/6/2014). I order the laksa, nasi lemak and also the Popiah. Well.. I see this is just over rating. It is normal to me. Laksa serve lub warm..nasi lemak only plain..and the turn off the the drink we order Barley ice got many ants inside.. the lady did not notice.. she take it out and never change the new drink for us. It is a super turn off!! I will boycott this place. The lady is so rude. Service and food are nothing to shout about. Shouldn’t recommend this place as she is arrogant . Its like you beg and pay for your food.